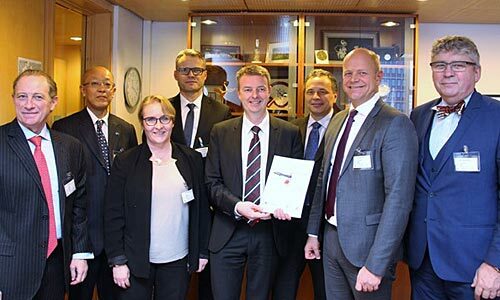 Norway’s Minister for Petroleum and Energy, Terje Søviknes, has received a new Plan for Development and Operation (PDO) for the Yme field, with a new name – Yme New Development. “The project will contribute to maintaining the activity level of the industry and will create valuable work places and meaningful repercussions for society at large. Repsol and its partners have, in collaboration with the service industry, done a solid job to bring forward this project,” says Minister Søviknes. The new Yme development, which was previously in production and shutdown, will combine existing and new installations. Investment in the project is projected to be approximately NOK 8 billion. “Repsol and the other licensees have created a development solution that makes use of existing infrastructure that will make it profitable to produce the remaining reserves,” adds Minister Søviknes. Yme oil field is located in the Egersund basin of the southern North Sea, approximately 100 kilometres from shore. Licensees are Repsol Norge AS (operator, 55%), Lotos Exploration and Production Norge AS (20%), OKEA AS (15%) and Kufpec Norway AS (10%).